MOLANDS Pleasure anglers have enjoyed the best sport on Molands with carp coming to floating baits and fish to nearly 20lb have fallen to this. Match weights to around 50lb have been best with the F1s not showing well after spawning but towards the weekend, there were signs of an improvement. Pole fished paste or pellet at five metres has been best for the F1s. Top pegs have been 2, 8, 12, 19, 25 – 29, 44 – 46 and 58 – 60. 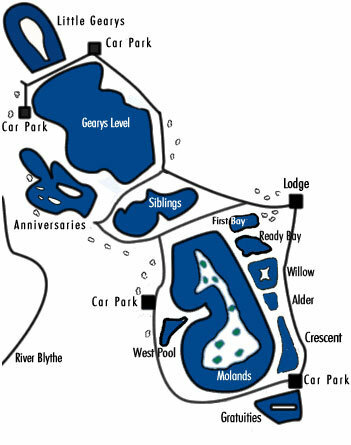 GEARYS Probably the best pool for numbers of carp with plenty of fish from 8lb to 15lb being caught. Bomb with boilies, wafters or 8mm pellet has been the top tactic and pegs 19 – 30 have been producing the better nets of carp. Good mixed bags of skimmers, crucians, tench and small carp are coming to float fished corn, pellet or chopped worm and caster with nets to over 40lb. The high bank is the best for mixed catches on pegs 7 – 15. LITTLE GEARYS The post spawning blues had set in early in the week which had really put off the F1s but by the weekend there were signs of an improvement and nets of F1s to over 60lb were caught and fish were showing all around the pool. Pole with caster/pellet fished shallow or down the margins with meat or caster has been the best for F1s. Carp have been coming to the pellet waggler or a small method feeder fished tight to the island. GRATUITIES Still a little slow after spawning with the better carp showing on the top and coming to surface baits or pellet waggler. Plenty of action to be had on the pole with caster or expander catching crucians, skimmers, small carp and the odd bigger bream or barbel. ANNIVERSARIES In decent form with good nets of beam in the 3 – 5lb range and F1s to 3lb coming out. Pole fished worm and caster are accounting for the bream while pellet or maggot is better for the F1s. Best pegs have been 2 – 6, 8, 10, 17, 21 and 23. WILLOW Another pool that has been in decent form this week with carp, F1s, skimmers and crucians being caught from all around the pool. Pole fished pellet, paste or worm have been working well and pellet waggler fished tight to the island is also catching well. SIBLINGS A (Doughnut) Picked up this week and good mixed catches of ide, carp and tench have been caught with chopped worm/caster, maggot or pellet fished down the middle working best. SIBLINGS B (Horseshoe) In good form this week with nets of F1s approaching 100lb coming to pole fished pellet or maggot fished shallow or down the inside margin. Best pegs have been around the end of the pool from 5 to 10.